You can use these with a regular pen to practice your "faux calligraphy," or use your favorite brush pen. You can even print it out on watercolor paper to practice your watercolor brush lettering. Print as many copies of the page as you want, until you feel like you've mastered the style you want! Need a card, but don't have time to practice? Use graphite transfer paper to trace directly onto your card! I love having some blank cards and envelopes on hand! At around 25 cents, they are still much cheaper than the card aisle. This practice page can be printed on any kind of letter-sized paper (8.5in x 11in). 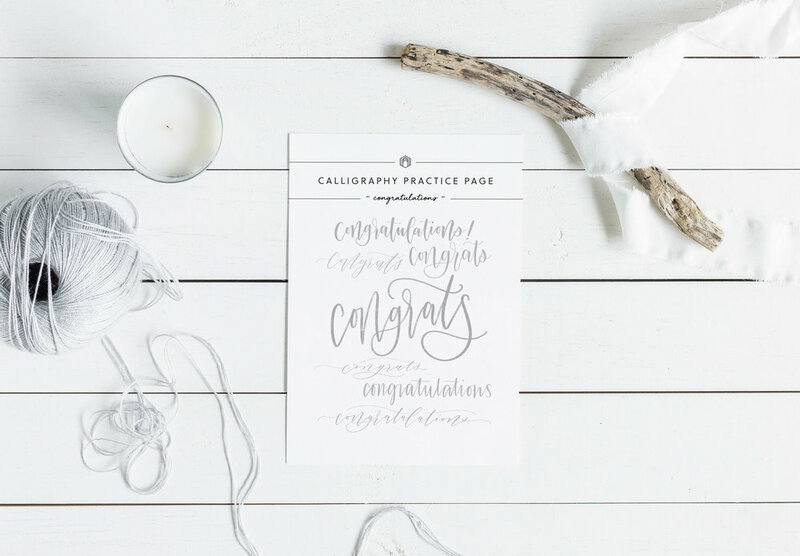 Practice any kind of lettering you want to practice, whether hand-lettering or "faux calligraphy," brush pen lettering, dip pen and ink calligraphy, or even watercolor brush calligraphy! If you would like to use a brush pen, I recommend printing the practice page on premium 32 lb laser printer paper. Unfortunately, it is possible to ruin your brush pen's tip with regular paper, which can be rough. Subscribe to our email newsletter below (which are few and far between, and always come with more freebies!) to receive access to the free printable!